There is not a Best M.O. among top leaders. Nor is there any M.O. that would exclude you from being a good leader. My research shows that the best predictor of both productivity and sustainability in complex and complicated environments is the degree of conative or instinct-based diversity among the core leaders in the C-Suite. In smaller organizations, with only a few people at the top of a narrow pyramid, the conative criteria for leadership also narrow. In a large and very complex organization with a collaborative culture, it works especially well to have a CEO whose instinct is to initiate in both the Fact Finder and Quick Start Action Modes, sparking both research and development programs. Another essential part of the conative mix is for such leaders to instinctively resist or just mildly accommodate Follow Thru systems. This is how such leaders keep their organizations from getting bogged down in redundancies or becoming too bureaucratic. It is essential, that leaders with this M.O. have CFOs, or other cohorts at the top, who deal with the complicated, more linear, financial, legal, and sometimes physical structures. It has proven wise to have a second in command who naturally plays the role of insisting on adherence to Follow Thru regulations -which he or she instinctively creates. It helps a set of such leaders to work in sync with each other if the second person accommodates Fact Finder strategies. When these leaders have equal levels of insistence in Fact Finder, they need to have clearly defined, separate responsibilities or they will end up with dueling priorities. Rounding out the M.O. of the cohort is a resistance in Quick Start, which adds a stabilizing force to the senior management team. In today’s world, the CEO often serves as the chief PR person in the face of scandals, recalls, attacks, and hackings. I don’t see many resistant Quick Start CEOs surviving through major crises like these. Quick Start energy is required when being a spokesperson dealing with uncertainty (note what happens to the grand orator in Obama when he addresses uncertainty). Resistant Follow Thrus are beaten up for not finishing what they start, but without their input organizations would stay put. The power of their randomness makes their resistance to sticking with the plan the ingredient that often saves the day. As confounding as it can be to their conative opposites, their natural ability to dodge bullets is a trait that helps organizations land on their feet. It is the Implementor leader’s insistence on precision and manifestation of ideas that makes this M.O. the most difficult to put in the C-Suite. It is essential, but often better in the field than the executive offices – as long as he or she is empowered to halt processes for quality control purposes. Given the freedom to skip meetings and lead the on-site troops, these leaders will add significantly to the power and quality of products and programs. Instinctive Facilitators are especially interesting to observe as they perform at high levels of leadership in organizations like franchises and health related situations; first, because in those environments leadership involves maintaining systems and second, because it involves maintaining ego-driven relationships – and the caring for a diversity of human beings. Their instinct to bring out the best in others and to build bridges between people reduces conflicts and keeps energy focused on purposes rather than personal issues. It is less complicated to diagnose the instinct-based leadership in an entrepreneurial organization. It is all about the naturally born entrepreneur trusting the combination of Quick Start insistent drive and back-up Fact Finder strategies. Without much Follow Thru budget making, a stand-alone entrepreneur needs to use the power of Quick Start persuasion to cut deals, and rope friends, family and vendors into becoming uncompensated co-conspirators. Of course, those who fill the need for creating Follow Thru systems are also essential. When a true entrepreneur builds an organization to the point where it requires the type of leadership team noted above, it is time for him or her to move on – and do it all over again. Leadership is not just about the use of conative instincts. But, nothing in my experience indicates that leaders, regardless of their M.O.s, initiate problem solving by using processes they have been taught. Their cognitive powers come into the process when they edit their instincts – and certainly when they second guess them. Leaders’ actions, triggered by whatever motivates them, are as tied to their instincts as their best salesperson’s instincts are tied to asking for the order. 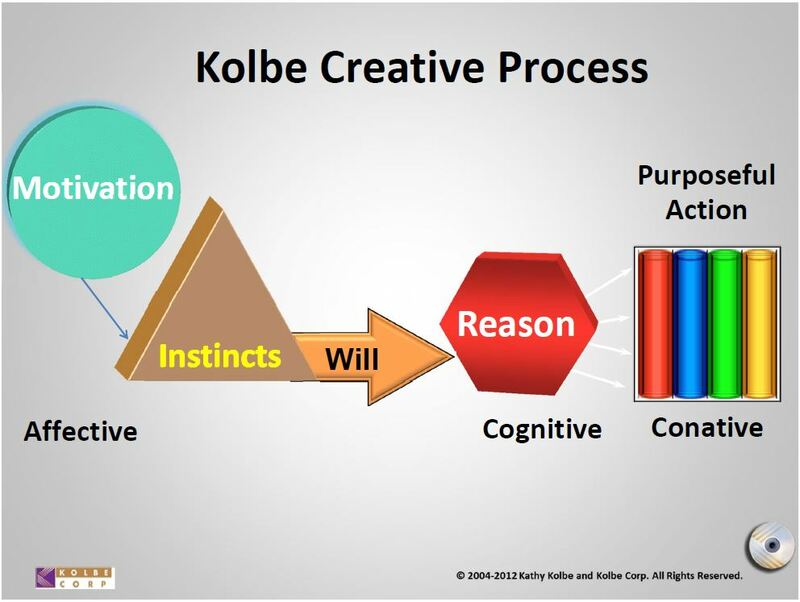 I do not belittle the power of the cognitive (it is not an after-thought in the Kolbe Creative Process). It’s a matter of what comes first. Instincts are precognitive. If that weren’t true, we would have no heroes – or top leaders. Having closely observed the creative efforts of thousands of leaders in vastly different types of problem solving situations, I have yet to see an example of solutions being initiated by them during a period of contemplation. The actions that spark productivity are born from the innate, authentic powers of a leader’s instinctive drive. Why Monday Morning Blues During Happy Hour Sunset? How could they be my friends and spend a lovely Sunday evening (while they could have been watching a magnificent sunset change from vibrant colors to muted tones) talking about how they were dreading going to work the next day. Both very intelligent, well-paid professionals were planning for their Monday Morning Blues. “Why don’t you find jobs that you would love to do?” I asked, even though I knew the answer. “It’s not that I don’t like my job, I would just prefer not to work,” one said. “You’re your own boss, Kathy, so you don’t know what it’s like to have to work at a job where you have to do what others decide you should be doing,” said the other person. Eyes rolled and they both ordered another drink. You will never create anything without a conviction that it’s worth creating. If you try to create something by making an effort that doesn’t fit your M.O., you won’t get very far with it. It takes a Commitment of your conative abilities for you to solve a problem in a sustainable way. Creative Problem Solving takes more than just Doing something you want to do, you also have to evaluate whether what you’re doing makes any sense. Judging whether another person is fully engaged in Creative Problem Solving is easier than judging levels of beauty. You can evaluate the process without judging the outcome. Q: Why bother evaluating the process if the outcome stinks? 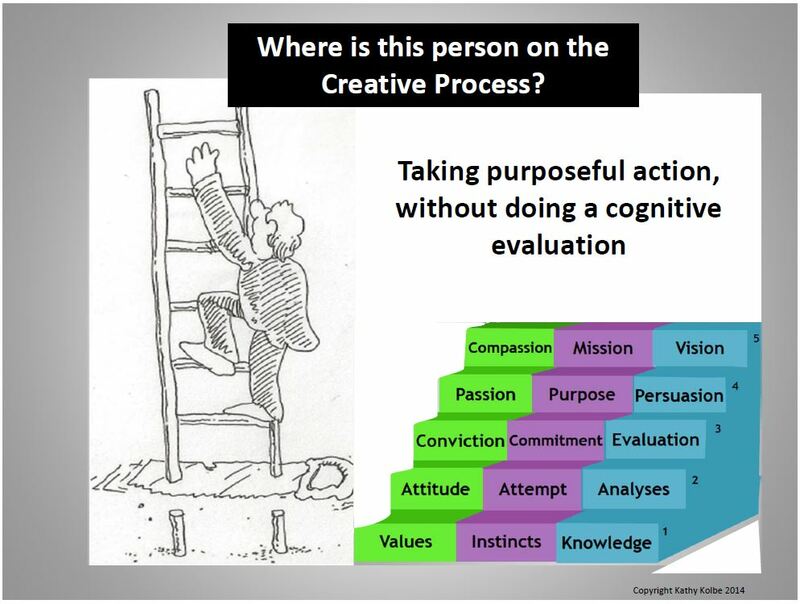 A: Because those who engage in the process are more likely to get consistently creative results. Q: Couldn’t someone who is not using a Creative Problem Solving process create something by dumb luck? A: Luck happens when you create the opportunity. Q: Is that all there is to your Theory of Creative Problem Solving? A: No, but I’ll wait for you to ask more questions here so I can tell you the things about it that you are motivated to discuss. You have an equal opportunity (or as one recent job candidate wrote in the first line of his resume: “an opertunity”) …to destroy your chances of getting called in for a job interview. Simple 1st step for getting out of a job interview is what 80% of on-line job applicants are doing: send blah, or blah that should have been spell-checked and proofread. Step 2: Show laziness + ignorance by either not including a cover letter, or (even better – for your purpose) sending a one-size-fits-all cover letter that doesn’t even mention what the company does or what the job requires. When you don’t take time to individualize your application for a specific role at a particular company, you won’t need to worry about a quality company taking your time for a job interview. They’ll immediately put you where you seemed to ask to be put – in the Not Interested pile. Step 3: If you’re still in danger of having to be interviewed, your next line of defense requires going beyond canned blah. You may need the help of an overused, senseless expert in bad blah, like the book, What Color Is Your Parachute. By using all of its meaningless “key” words, you have a recipe for avoiding the disclosure of any spark of your own creativity or insight. This me-too approach will keep companies from expecting too much from you. Step 4: You shouldn’t have to put this much effort into not being selected for interviews, but this just-in-case step improves your odds of not being interviewed because it insults the intelligence of whomever makes those recommendations. Be sure you take this step to extremes. Unfortunately for you, many others seem to be catching on to this trick. You’ll have to one-up what is being said by all the other wannabe losers. Use highly unbelievable statements about how much you have done in so little time (“I worked for a very high status company for 6 months, and during that time I increased corporate revenues by 28%). Or how you saved an entire company from disaster by your discovery of all of their mistakes (“Reviewed and redesigned corporate strategic plan and established a workable system that impacted the productivity of all departments.”) Or how just little “newbie-you” outsmarted the corporate culture (“I introduced the company to the world of social media and got thousands of on-line followers to chat with us.”). Step 5: Not sure you can sound more boastful than so many others? This last step is what some have used as the dagger in the heart of an almost-ready-to-interview-you situation. You may even find it fun: Complain about the potential employer’s hiring process. It feels like there is mostly Thinking going on in many academic programs, from fourth grade through undergraduate programs in universities. Where does the Doing get done? Not in lecture-based classrooms. How inappropriate that parents, not teachers, often end up helping kids DO their homework – where most of the learning actually gets done. Decades of research shows that learning happens by Doing. It’s called Active Learning in today’s literature. The proper term for the Doing domain of the mind is Conation. Every field of study deals with conation. Yet, a century of perseverating about cognitive Thinking has led to contemporary blindness of the pervasiveness of conative Doing. Marketing textbooks, when discussing the fallacy of focus groups asking for opinions (Thinking), point out that they are not a good predictor of what people will Do in the actual purchasing process. Law school texts warn of the need to distinguish the difference between Thinking about and actually Doing (or committing) a crime. Religion and philosophy courses deal with the difference between Thinking in moral ways and actually Doing moral or immoral acts. Language classes teach the difference between passive verbs (Thinking) and active verbs (Doing) – the latter even known as conative verbs in some languages. Engineering programs tackle issues of sustainability – this does not mean keeping a level of Thinking, but rather sustaining levels of energy or Doing. Medical and health related programs cope with issues related to getting patients to Do what they need to Do, not just Think about what they need to Do. The term coming into greater use is now referred to as the patient being Active, as opposed to the former negative labeling of patients as Non-compliant. Name a field of study and there will be issues dealing with the differences between Thinking and Doing. Doing will always be the key to breakthroughs, innovation, discoveries – or any other word synonymous with Success. The programs that “Get Conative” become the leaders in their field.